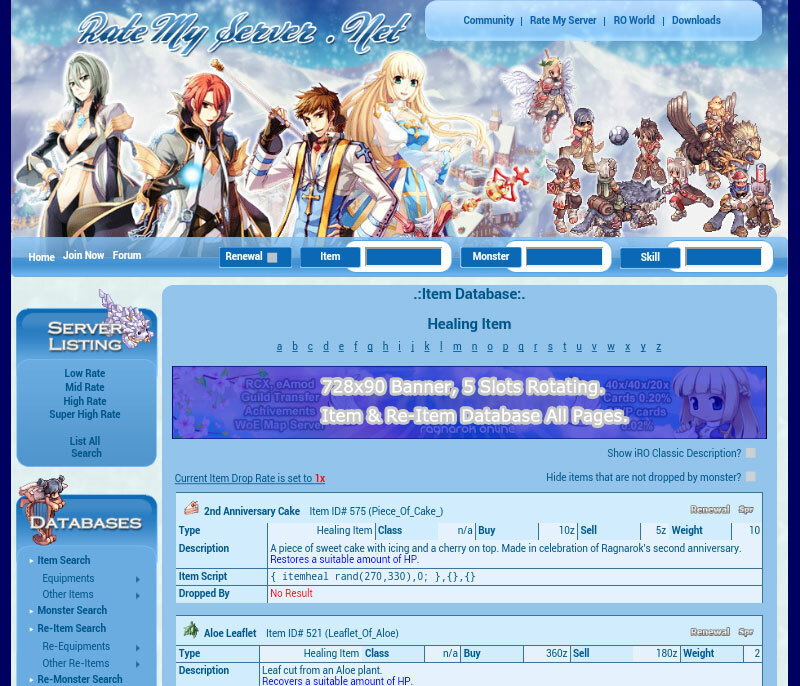 RateMyServer.Net has been serving the Ragnarok Online Community since 2005. We've reached a majority of RO players from all over the world. 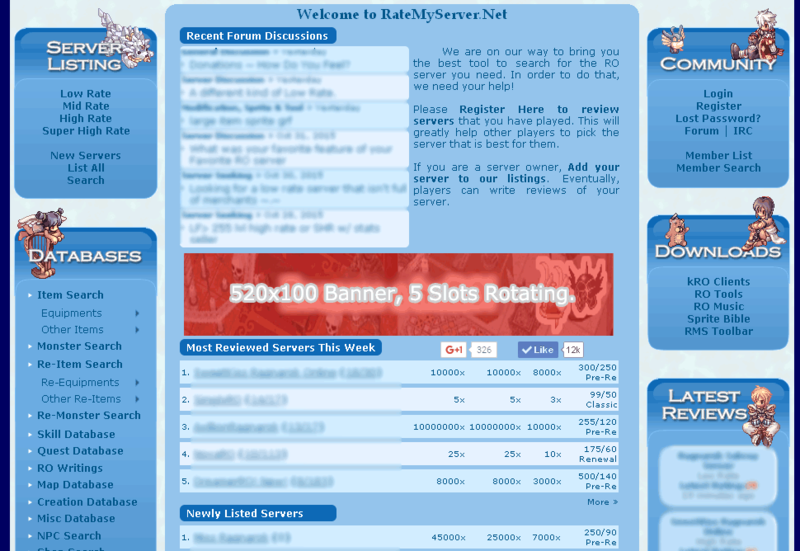 We are now offering server owners the opportunity to further advertise their servers on RateMyServer.Net. For a flat fee starting from as low as $15 USD per month (a minimum of 30 days), you can choose to advertise your server on many of the high traffic area of our website. Start by choosing any of the advertisement options below and send us your order at . You can also send us a request to be added to a waiting list if your desired advertisement spot is currently sold out. An URL link or attachment to your advertisement image (following the ad specification of the advertisement option). The URL to the advertisement's landing page (most likely your server's homepage). The type(s) or name(s) of the advertisement space(s) you would like to purchase (any advertisement options available below). How many slot(s) you are purchasing for the type of advertisement(s). 1. Budget Advertising: $15 per month, 5 slots rotating. Price: Each slot is $15 USD per month (a minimum of 30 days). Ad Position: Above the server list on the corresponding server listing page. As indicated by the image above. The 468x60 spot is divided into 5 slots. Statistically, this means for every five person visiting the page, your advertisement will be shown to one of them. Traffic Estimation: Varies. 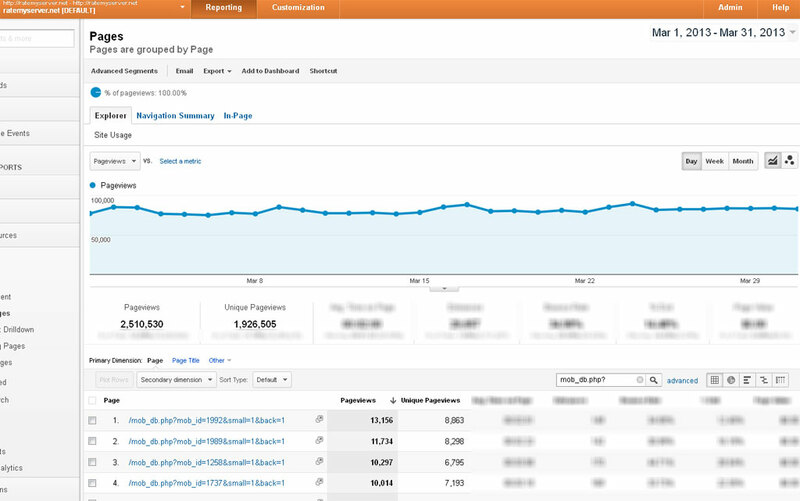 Please see this screenshot for a sample one month stats generated from Google Analytics. Image Dimension: 468x60 pixels (width x height). Image Size: 250kb or lower. Image Format: jpg, gif or png. Let us add you to our waiting list if your desired advertisement spot is currently sold out. Each slot is $80 USD per month (a minimum of 30 days), 5 slots rotating. Ad Position: On the front page of our website, above the Most Reviewed Servers of the Week listing. As indicated by the image above on the left, the space in red with "468x60 Banner, 5 Slots Rotating" written on it. Each slot is $100 USD per month (a minimum of 30 days), 5 slots rotating. Ad Position: On the front page of our website, above the Most Reviewed Servers of the Week listing. 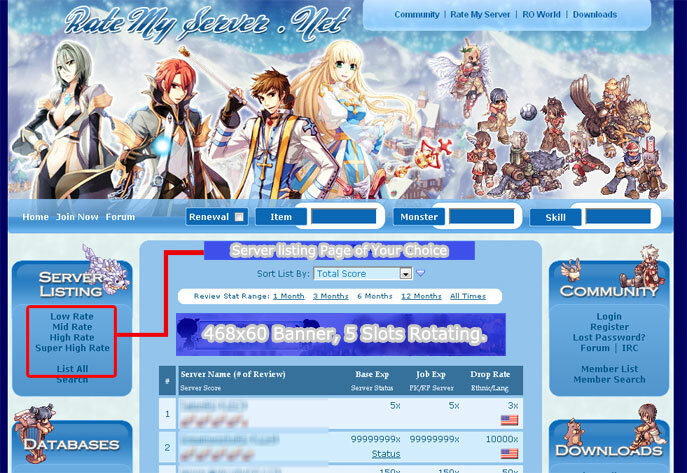 As indicated by the image above on the right, the space in red with "520x100 Banner, 5 Slots Rotating" written on it. Image Dimension: 520x100 pixels (width x height). Availability: Please see availability of option 2a. above. Each slot is $30 USD per month (a minimum of 30 days), 5 slots rotating. Ad Position: On the front page of our website, below the Newly Listed Servers listing. 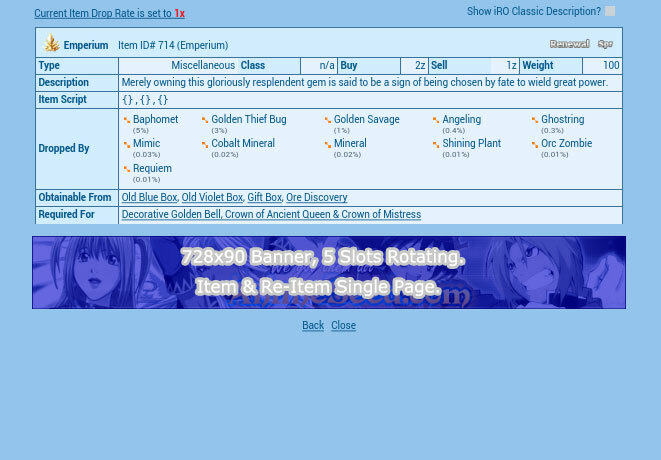 As indicated by the image above on the left, the space in blue with "468x60 Banner, 5 Slots Rotating" written on it. Image Size: 300kb or lower. The advertisement space is divided into 5 slots. Statistically, this means for every five person visiting the page, your advertisement will be shown to one of them. Quality Advertising: $35 per month, 5 slots rotating. Price: Each slot is $35 USD per month (a minimum of 30 days). Ad Position: On every simplified item info page, which is part of the item and re-item database. The simplified version of our item info pages are opened whenever a user clicks on an item link from our main site. The simplified pages does not display our main navigation elements, leading to faster loading time and more attention devoted to the advertisement on the page. 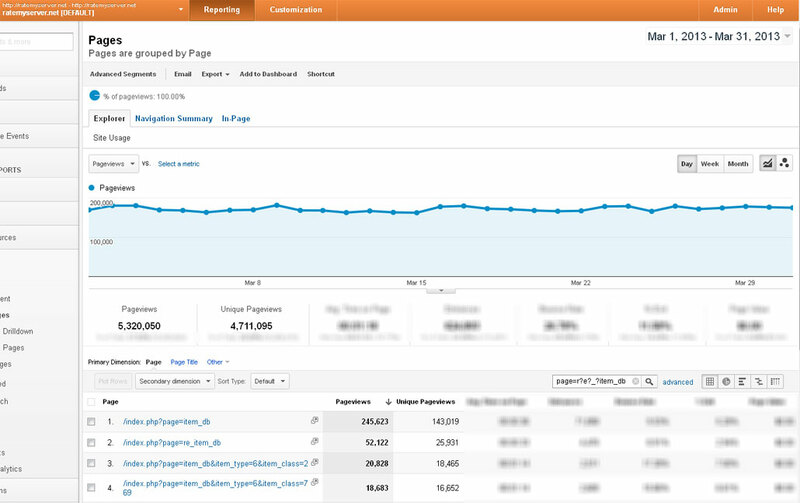 Traffic Estimation: Please see this screenshot for a sample one month stats. Image Dimension: 728x90 pixels (width x height). Image Size: 400kb or lower. VIP Advertising: $45 per month, 3 slots rotating. Price: Each slot is $45 USD per month (a minimum of 30 days). Ad Position: Below the Link Block of the left navigation menu on our Monster & Re-Monster Database result pages. The advertisement space is divided into 3 slots. 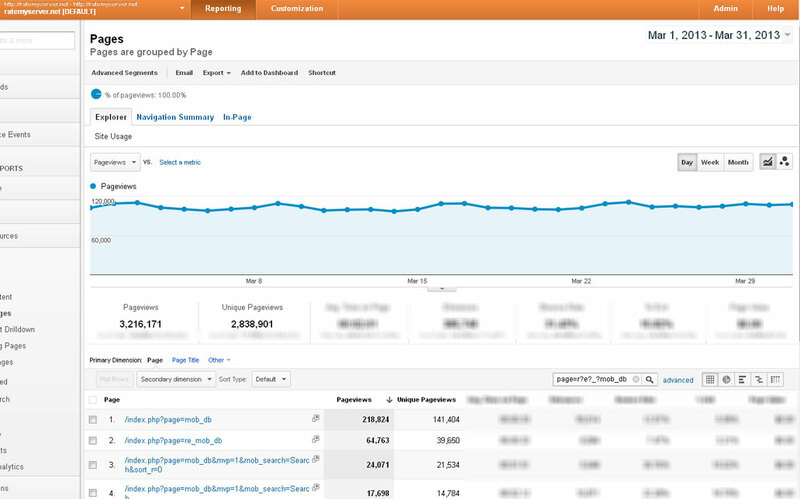 Statistically, this means for every three person visiting the page, your advertisement will be shown to one of them. These ads appear on every monster search result page except for single ID search. This is because when there is only 1 result to display, the page usually does not have enough content to reach the lower end of the navigation menu. 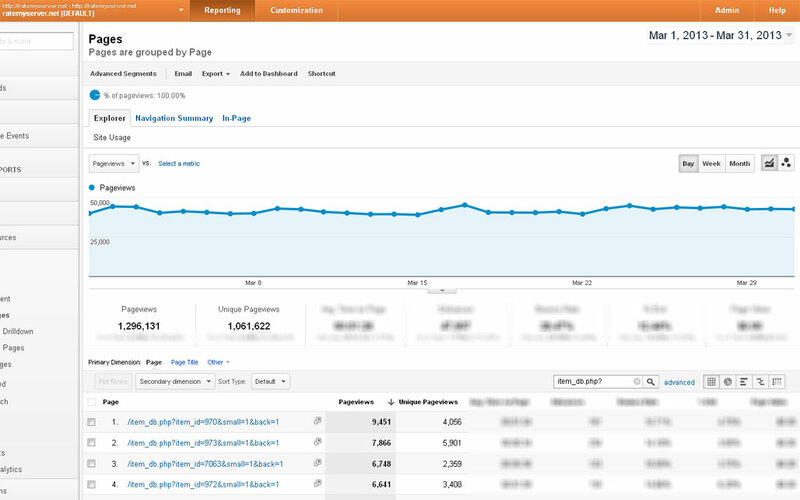 Traffic Estimation: Please see this screenshot for a sample one month stats. 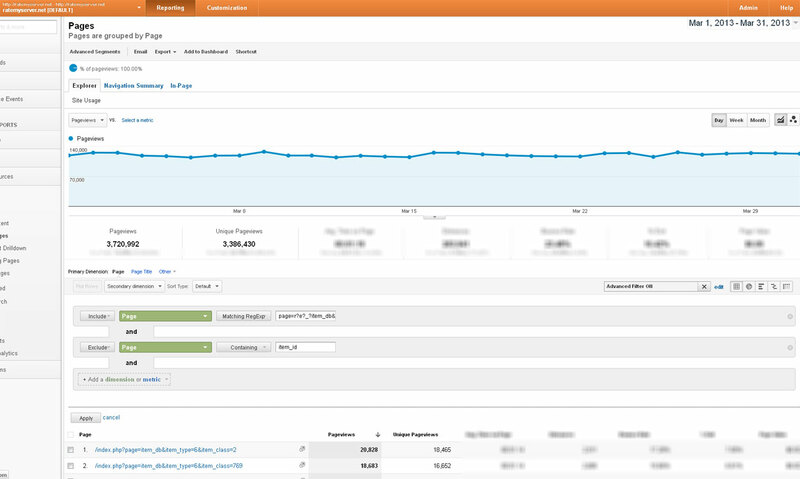 The stats page is generated from Google Analytics with single ID search traffic excluded. Image Dimension: 120x600 pixels (width x height). Quality Advertising: $60 per month, 5 slots rotating. Price: Each slot is $60 USD per month (a minimum of 30 days). 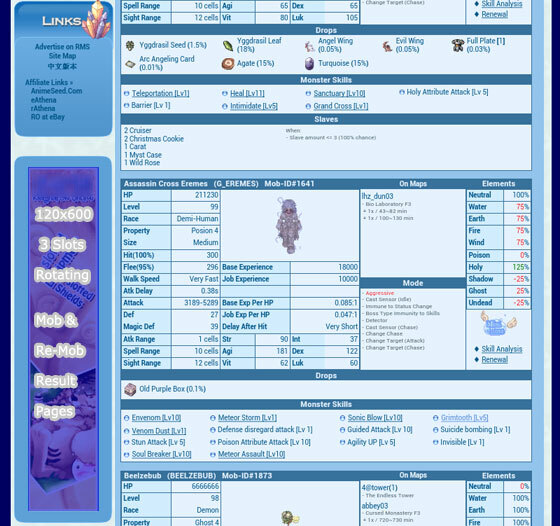 Ad Position: On every simplified monster info page, which is part of the monster and re-monster database. 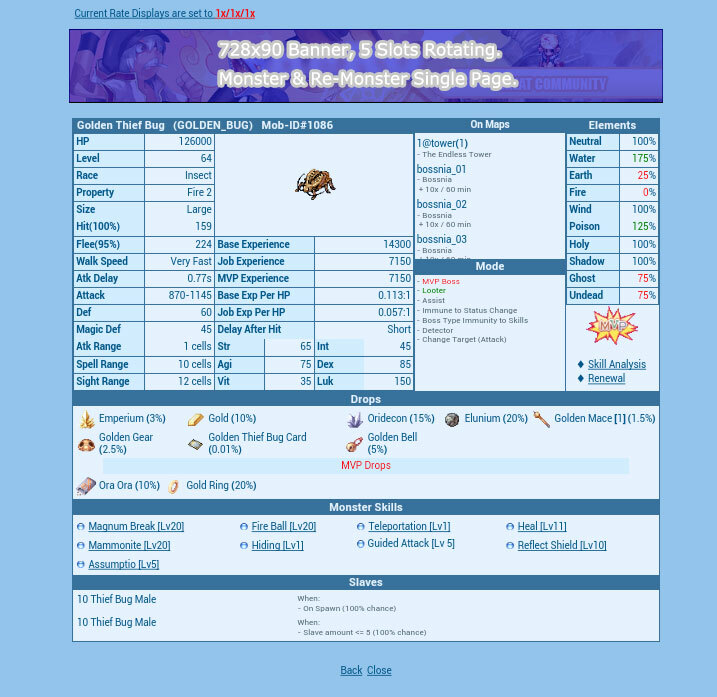 The simplified version of our monster info pages are opened whenever a user clicks on a monster link from our main site. The simplified pages does not display our main navigation elements, leading to faster loading time and more attention devoted to the advertisement on the page. VIP Advertising: $75 per month, 3 slots rotating. Price: Each slot is $75 USD per month (a minimum of 30 days). Ad Position: Below the Link Block of the left navigation menu on our Item & Re-Item Database result pages. These ads appear on every item search result page except for single ID search. This is because when there is only 1 result to display, the page usually does not have enough content to reach the lower end of the navigation menu. Premium Advertising: $150 per month, 5 slots rotating. Price: Each slot is $150 USD per month (a minimum of 30 days). 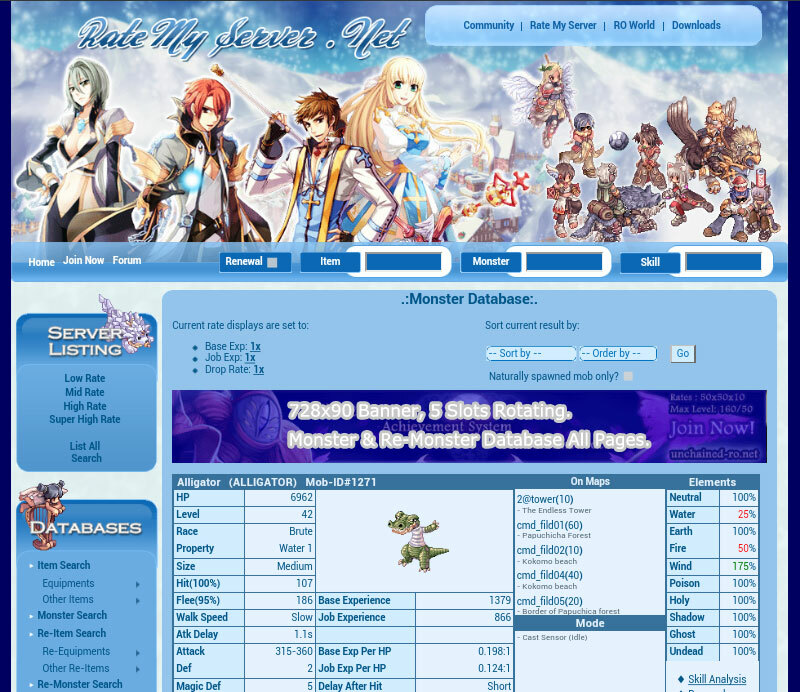 Ad Position: At the top of our monster and re-monster database pages including the search form pages. The advertisement space is divided into 5 slots. Statistically, this means for every five person visiting the page, your advertisement will be shown to one of them. Premium Advertising: $250 per month, 5 slots rotating. Price: Each slot is $250 USD per month (a minimum of 30 days). 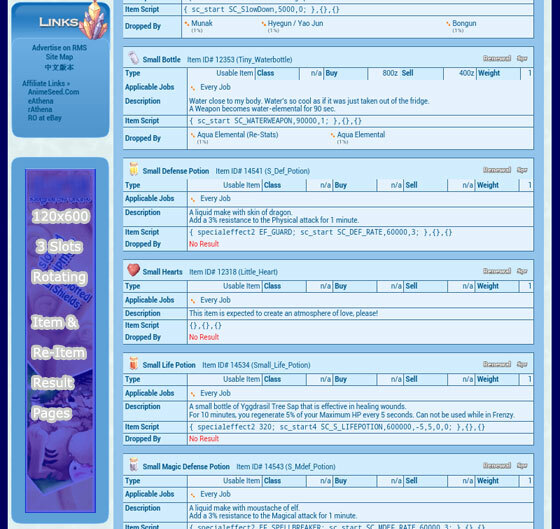 Ad Position: At the top of our item and re-item database pages including the search form pages. The advertisement space is divided into 5 slots. Statistically, this means for every five person visiting the page, your advertisement will be shown to one of them. Please note that we only accept payment in the form of PayPal. Refund will be handled on a prorated basis according the number of days the banner shown before the refund request. A $10 administration fee will be charged for each refund request. For all type of advertising, we will host your banner on our server. This is to ensure our website performance and loading time will not be affected by any third party. 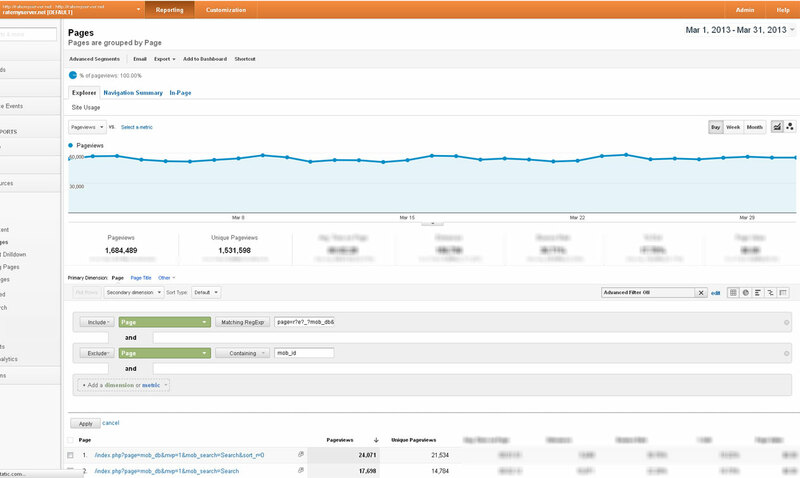 You are welcome to add parameters to your link URL to track results. Request to change banner can be made by emailing us any time. Image of advertisement must not bring any distraction to our visitors such as excessive flashing or image that contains racist messages. We reserve the right to reject using any image that we believe will have a negative effect on our visitors. Banner space will be sold at a first come first serve basis, while quantity last. Let us add you to our waiting list if your desired advertisement spot is currently sold out. Customers on our waiting list will be contacted once the desired slot is available. Thank you for your interest in advertising with us. If you have any suggestion to our advertisement program or if you wish to advertise at a spot that is not listed above please do not hesitate to email us at .